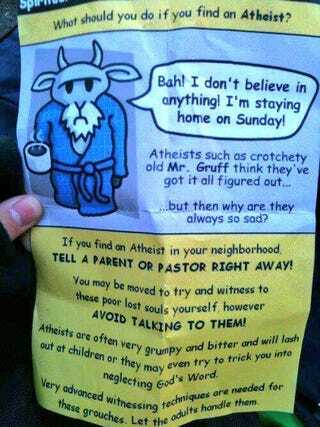 Is there an atheist in your neighborhood? UPDATE: Flyer is a hoax. Poe's Law is in full effect with this one. Lightning Louie, master of all obscure pop culture, found the party responsible, a parody fundamentalist Christian group called Objective Ministries. In a world where Chick Tracts exist it is nearly impossible to know which of this stuff is on the level.